From the humble beginnings in the late 1970s, street art came to be one of the most versatile fields of artistic expression and a global art movement. Among many different techniques and styles creative individuals can choose to work in these days, stenciling is still among the most popular. There are many advantages to this particular technique and there are several reasons why it remained one of widely present public art forms. First of all, it is among the fastest and most easiest to use. Secondly, it allows quick replications of the piece and, therefore, the far-reaching presence of the message the artist is trying to send. Finally, because of its simplicity and straightforward messaging, stencil art communicates immediately with the viewers, regardless if they belong to the arts community or come from non-art audiences. Stencil graffiti have been developing parallel to other street art forms and, over the years, they evolved from simple monochromatic images and texts into colorful, sophisticated and elaborate artworks. Nowadays, it is more than often said that Banksy was the one who made stencil graffiti famous on a global scale, but the story of stencil art goes way beyond the work of this single artist. 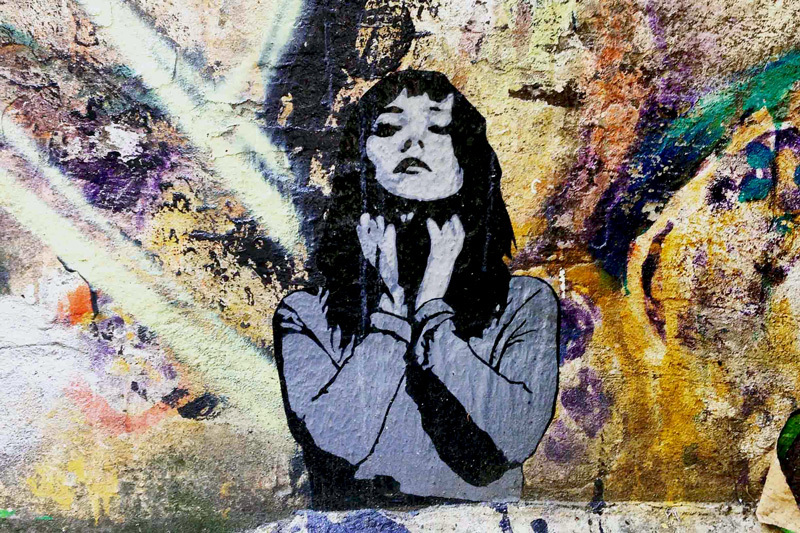 In today’s article, we are taking a brief look at the evolution of this popular street art technique, with an overview of Berlin’s stencil art scene and its most prominent names. Essentially, stenciling is a simple DIY technique. The design is cut from a piece of a cardboard, paper or other media, creating a template that can be painted through with spray-paint or paintbrush. It is also thought to be one of the earliest decorative art techniques, with the examples dating back from ancient civilizations of Egypt and China. Stencil artworks are easy to produce and most importantly reproduce. Depending on their complexity, they can be executed in a very short amount of time. The speed of creation is among the most important qualities, especially for those early “hit and run” days of graffiti art, but not without significance for contemporary arts makers who still have to hide from the police, if creating illicit pieces. Although the medium has evolved significantly in the last couple of decades to include complex multilayered artworks, stencil graffiti are mostly executed in a single color or limited color palette. The simplicity of design is what makes stencil graffiti easy to read and communicate with the wider audience, compared to subway-style graffiti and graffiti tags that can solely be interpreted within a framework of closed communities of graffiti writers. The other benefits of stencil graffiti include their longer lifespan, mostly because of their carefully chosen locations. Perhaps more than any other street art technique, stencil art relies on site-specificity. The integration of artworks into urban landscape can be motivated by aesthetic, symbolic or political reasons and stencil artists tend to be especially conscious when it comes to the placement of their pieces. As in any other form of urban interventions, the communication between the artwork and the intended audience is of essential importance, which leads us to the origins of stencil art and its evolution. We can follow two routes in explaining the history of stencil art in relation to modern street art practices. One is the utilitarian aspect of stencils originating from the commercial and practical uses of the form, the one rooted in industrial practices and public signage. The other is the use of stencils in protest art and revolutionary politics, notably in Europe and South America. Blek le Rat, one of street art pioneers who was granted the title “Father of stencil art” stated on various occasions how the initial influx to experiment with stencils came from his childhood memories of stenciled images of Mussolini on walls in Italy. Just like poster art, stenciling holds a strong connection to the 20th-century art of protest and political propaganda, and it is one of the main reasons why stencil graffiti are even today associated with political and social commentary, more than traditional graffiti methods. On the other hand, stencilists appropriated techniques of public signage and industrial packaging style, mimicking the idea of official signage and using it to parody the notion of authority. Over the years, stencil graffiti have moved beyond stencil typography and iconography of political imagery into various pictorial, visually challenging and intricate compositions. 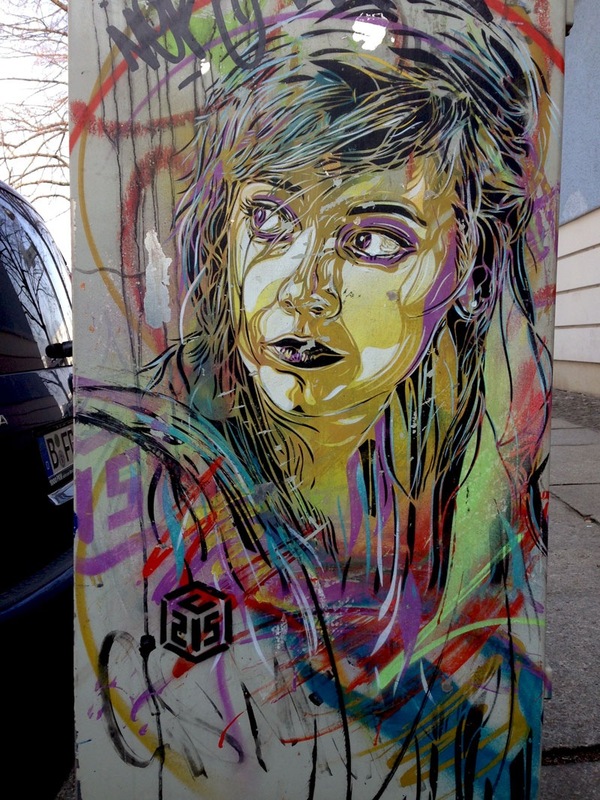 Some of the best examples of how refined and elaborate stencil art became nowadays are the works of American artist Logan Hicks and French artist C215, to name a couple. In his book Stencil Graffiti, Tristan Manco closely links the stenciling movement to new wave and punk subcultures of the late 1970s and 1980s. As he states “punk movement used stencils because they fitted the general do-it-yourself philosophy and were a reference to utilitarian and military style, which punk appropriated to subvert symbols of authority”. The rebellious spirit of stencil activism, therefore, became widely present in the cities with strong subcultural scenes – Berlin being among the most prominent in this regard. We recently mentioned the role of punk anarchists in relation to Berlin Wall graffiti, and much of the pioneering work in stencil graffiti can be contributed to a group of artists who were at the time involved into city’s punk scene. 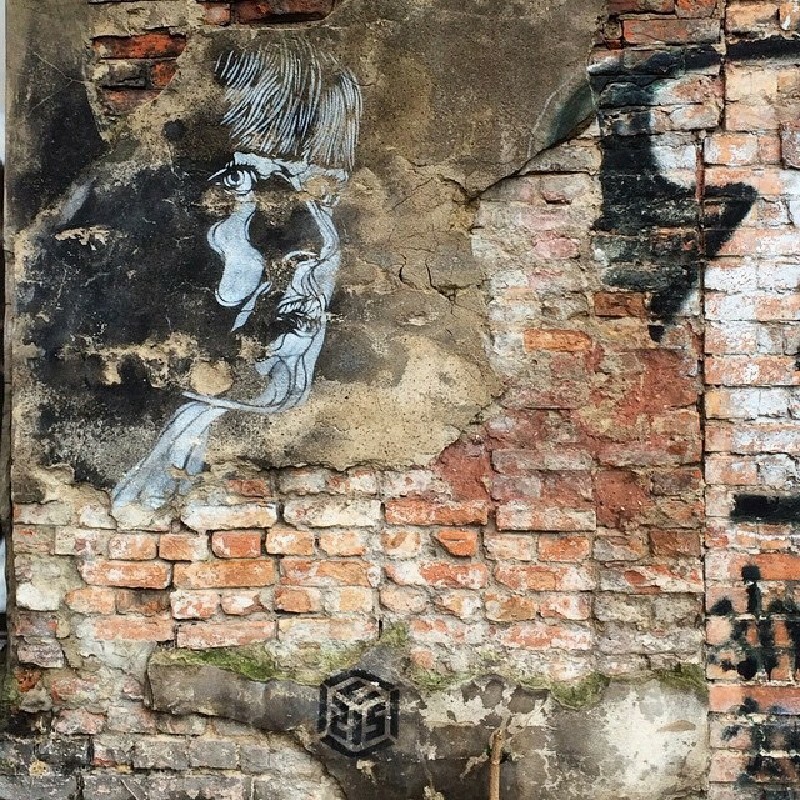 The work of Polish-born artist Czarnobyl, who moved to Berlin in the early nineties, nicely illustrates the street art tendencies which revolved around punk culture and politics and influence it had on Berlin’s art of stenciling. Today he is considered one of the finest Berlin’s stencil artists of those pioneering generations. Berlin’s reputation as one of few cities that embraces all forms of public expression naturally attracted many influential stencil artists. 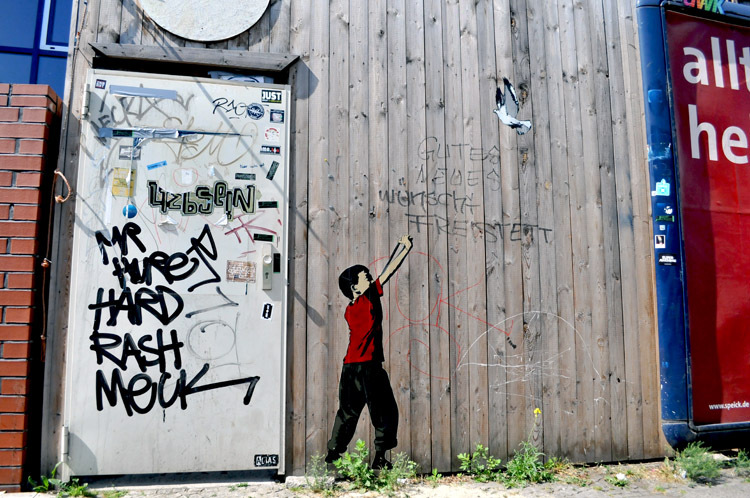 Over the years, streets of Berlin became home to stenciled pieces created by Banksy, Nick Walker, Above, Dot Dot Dot, Icy & Sot, and Shepard Fairey, artists who are among the most praised in the field. However, Berlin also has some prolific local artists who have gained international recognition. A group of the most prominent street artists in Berlin who work primarily in stencil technique includes EVOL, Alias, Boxi and XOOOOX. Their works can be regarded as an illustration of unique approaches to stencil graffiti in terms of content. 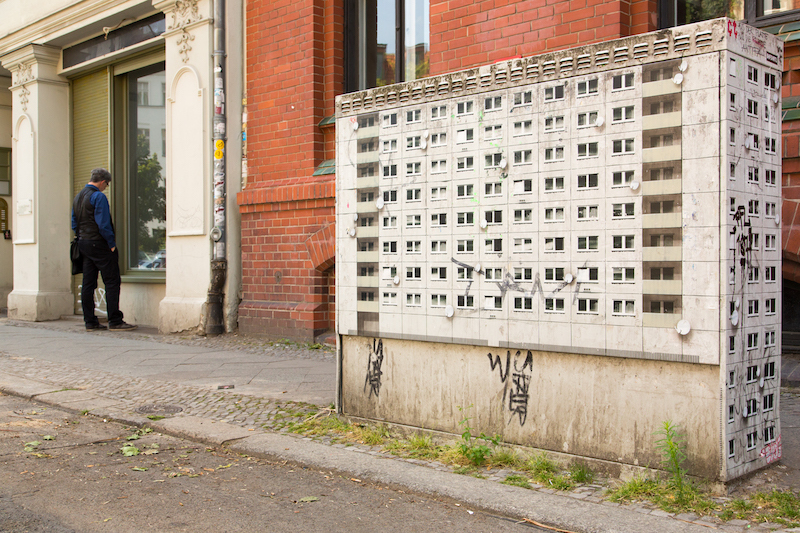 EVOL has been active in the streets of Berlin for well over a decade and his miniature architectural odes to Social-Realism have gained the status of fleeting landmarks. Inspired by the everyday life, he incorporates different cultural elements of Berlin’s turbulent past into his work, making architectural maquette-like pieces as clever reminders of the collective urban history. Boxi, on the other hand, makes life-size stenciled works of representational quality toying with the superficiality of human perception. His work is visceral, open to interpretation and thus suggestive of the absence of an absolute truth, while he utilizes visual elements of Romanticism and classical painting. Alias and XOOOOX have both developed a recognizable set of captivating characters, but where Alias focuses on presenting marginalized and lonesome individuals XOOOOX describes his work as an homage to the fashion world and conventional beauty. XOOOOX’s subjects are often represented objectively while Alias focuses on the psychological aspects of his characters aiming to trigger a direct emotional response from the viewer. In both cases, the works are aesthetically appealing, as they are socially and politically poignant. If we look at the current stencil activities around Berlin, Cazl and Ostap are among the most prolific, while we are yet to see the sphere of their influence in this particular scene. With the works of productive local and international artists, Berlin is a great place to search for some stenciled art masterpieces. 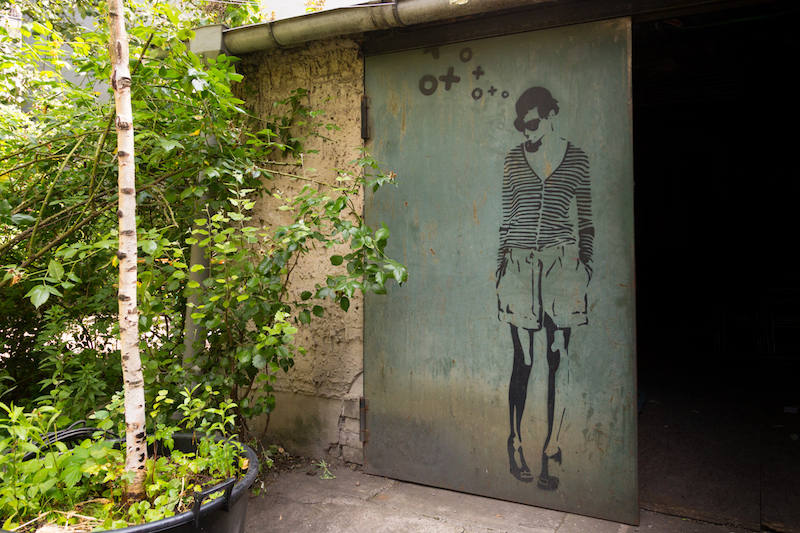 If you find yourself in need of help on your quest, Berlin Street Art tour is a great idea when it comes to exploring the world of stencils on the city streets.